The Microsoft Corp. co-founder has pledged to give away most of his fortune to charity. "[M]y philanthropic efforts will continue after my lifetime," Allen said in a statement Thursday. "I've planned for many years now that the majority of my estate will be left to philanthropy." Allen's commitment comes as two of America's richest men, Bill Gates and Warren Buffett, have invited fellow billionaires to give half their wealth to charity. The unusual initiative is being promoted through the website GivingPledge.org and is aimed at members of the Forbes 400, a list of the richest Americans. Allen has donated more than $1 billion through personal giving and his foundation. The 57-year-old billionaire was diagnosed with non-Hodgkin's lymphoma in November 2009, more than 25 years after he was treated for Hodgkin's disease, a spokesman at his company Vulcan Inc. said at the time. Allen, who co-founded Microsoft with Gates in the mid-1970s, was that company's chief technologist until he left in 1983, the year he was treated for Hodgkin's lymphoma, according to the website for his Paul G. Allen Family Foundations. In March, Allen ranked 37th on the Forbes list of the world's billionaires. His net worth was $13.5 billion, according to the magazine. Allen once said, "When it comes to helping out, I don't believe in doing it for the media attention. My goal is to support the organizations that need help." The Nobel Peace Prize winner turns 92 on Sunday and is scheduled to publish a new autobiography this October. According to publisher Farrar, Straus and Giroux, "Conversations With Myself " will draw upon Mandela’s personal archive of never-before-seen materials, including journals he kept while on the run during the anti-apartheid struggle of the early 1960s, diaries and draft letters written at Robben Island and other South African prisons during his 27 years of incarceration, and his notebooks and privately recorded conversations. DanceWithShadows.com reports that Verne Harris, director of the Nelson Mandela Foundation in Johannesburg, said that the book will depict the leader "not as a saint or an icon, but as a person." President Obama has written the book’s forward. Mandela was released from prison in 1990, received the Nobel Peace Prize in 1993 and was inaugurated as the first democratically elected president of South Africa in 1994. The Texas Board of Regents voted unanimously Thursday to change the name of Simkins Residence Hall, a University of Texas at Austin dormitory named after a man prominent in the Ku Klux Klan in the 1800s. "Creekside Residence Hall and Creekside Park will replace the current names of Simkins Hall and Simkins Park, respectively," officials with the University of Texas System announced in a statement. The dorm was built in the 1950s and named for William Stewart Simkins, who taught at the University of Texas at Austin's law school from 1899 until his death in 1929. Earlier this year, Russell, a former University of Texas law professor, published a research article on Simkins. Russell told CNN on Thursday that Simkins "was a gun-toting, mask-wearing nightrider, and his fellow Klansman who murdered 25 people during a three-year period in just one of the counties in Florida in which he operated." Russell said university officials named the dorm for the Klan member shortly after the 1954 U.S. Supreme Court decision that integrated schools. Russell, now teaching at the University of Denver, wrote in his paper that "during the 1950s, the memory and history of Professor Simkins supported the university's resistance to integration." Russell said he didn’t expect the university to make the name change. "I did hope to provoke a conversation about race, history and law. That’s been successful beyond my wildest dreams." The retired janitor will receive an honorary degree on July 30 from Missouri State University in Springfield, the hometown college that denied her admission in the summer of 1950. USA Today reports that Walls, a high school salutatorian, was the first African-American student ever to apply to what was then known as Southwest Missouri State University. But, according to university records, the school was uncomfortable at that time becoming a "guinea pig" in a situation involving equal educational opportunities. Walls told the newspaper that she wanted to become a teacher. She eventually had eight children, 12 grandchildren and 14 great-grandchildren. Sixty years later, the 78-year-old said she’s not sure what she’ll do with the college degree. "To me, it would be an inspiration to my children. They have been raised in a better world," she told the paper. According to Missouri State, the school’s increasingly diverse student body now includes 616 African-American students. The 42-year-old breast cancer survivor from Springfield, Ohio, plans to celebrate her 18th wedding anniversary this Sunday by crossing the Nautica New York City Triathlon finish line. Since January, Dr. Sanjay Gupta and the producers of CNN Medical News have been working with six people who took the Fit Nation Challenge to participate with Gupta in this weekend’s triathlon. So Brouhard has spent the last six months swimming, biking and running. Brouhard learned she had breast cancer in April 2009. After various treatments, medications and surgeries, the mother of three children said that the cancer was gone, but it left her out of shape and uninspired. Her husband found an ad for the Fit Nation Challenge, and they both thought it was a perfect fit. Brouhard said the triathlon was not only her motivation to get back in shape, but a way for her to set an example for all women who have faced breast cancer and other illnesses. "I hope that I can be an inspiration to others," Brouhard said. "I think it will be such a feeling of satisfaction for myself to complete this, knowing I can put the cancer behind me. I think it will be an emotional day." I think it is wonderful to leave such a legacy. "The river was the lifeblood of the village. All day the villagers expended their energy making a living from the river. One day, a villager saw a baby floating down the river. She pulled the baby out of the river. Soon, more and more babies appeared floating down the river. Eventu-ally, the villagers were spending more energy saving and raising babies from the river than they were making a living from the river. More and more village people were jumping in to help pull the children out of the river. One particularly bad day, a wise elder was standing on the river bank while others were overwhelmed by the flood of babies. "Help us," the others screamed. “No,” the wise one said, "I am going to go up stream to find out why the babies are being thrown into the river and stop it from happening." "
If every wealthy person gave half their money to non profit groups which spend all their time "pulling babies out of the river", the actual problems (or social diseases if you prefer) would still never be treated. Only when our country starts to think beyond rescue missions and addresses the underlying "illnesses" will we see real change. This is an absurd write up by a cynical loser. You're half assed attempt at making a point is littered with dopey generalizations and a ridiculous parable. What would you know about "most" non profits and how they operate? You're probably the same type who refuses to give a homeless person a dollar cause "They'll just spend it on beer". How arrogant can you be to assume that your dollar will change their life? Same thing applies in weakening your argument against donating to charity. The intent is to alleviate suffering – even short term and near sighted suffering. Oh shut up, you arrogant, self-important gasbag. Excellent response. If I were in the same position to alleviate suffering, I would use a different approach. If the wealth that someone has to contribute is in the billions, then why not buy a Drug Pharmaceutical company and make it a non-profit. That is, put money to work to actually find a cure for cancer and other diseases. As it stands now, most Drug companies look for a pill treat the symptons and not cure disease, for the most part. Even the common cold continues to be misery to billions of people every year, yet a lot of money and effort goes to provide relief of symptons, since that provides a consumable cash flow machine to Drug companies. A cure would destroy the cash machine, but it would alleviate suffering. I hate that some non profits are companies now, not charities, they keep the lions share of the funds, they invest them and use those investemts to pay their managers and above extortionate wages. Some of the problems in the world can be pointed at overcrowding and this is due to the church in some respects with its no protection policy, others are because theres nothing else to do. Wars are when one side has things the other wants or needs and they will fight for it...southern africa helps point a lot of this out....building schools is good and worthwhile unless your building them at a time when theres still a war going on then your goods get stolen, your people scared off, the buildings burned, the food stolen or percentages paid to keep them flowing. I can't stop shaking my head at some of these off base remarks. Yes, TheRealityChecker makes valid points about solving the problem at the source, but how do you know the agencies that are directly helping people who suffer or addressing front-line problems DO NOT take the long view and look for solutions? Do you folks who are complaining about "wasting" time or money on the homeless person in the street actually know what goes on at non-profits? I've spent most of the last fifteen years working at front line, grassroots non-profits trying to make a difference in peoples' lives, and in a balanced way: not just "working for the future," but offering stabilization now. Think of it this way: if the river floods, are you just going to worry about stabilizing or rebuilding the dam? Or would you consider setting up sandbags on the banks of the river to try to stem the flow? I spent three years working for a group addressing street homeless issues. I spent half my time walking in garbage dumps, river banks, under bridges, and in "shooting galleries" where addicts went to inject drugs trying to educte and get them the services they needed to survive. Might have been giving them the first meal they'd had in days, or it could be a referral to a doctor, or a clean pair of shoes because their last pair was stolen. The other half of my time was spent crawling the halls of the state legislature, fund-raising for educational or treatment programs to keep people from ending up homeless, or educating other agencies, hospitals and companies on changes they can make on a larger lever to keep people from becoming homeless. Let go of the black-and-white thinking that non-profits only try to fish the babies out of the river and not try to stop it. If you are saying that all non-profits operate this way, you have never really known a non-profit. 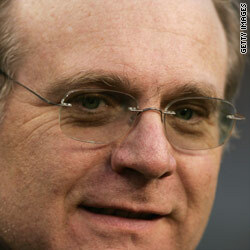 I think, genuinely, Paul Allen, etc. are good folks doing good things. I also think, however, that as the middle-class is being taxed TO DEATH, and the bottom fraction (read that 47% of Americans) pay NO TAXES or NEGATIVE TAXES, and the richest pay little as well, that huge charitable deductions ought to be a thing of the past. Allow Mr. Allen to deduct or exclude 70% of his gift (or pay a modest gift tax, similar to what he would pay if he gave these funds to a private person – 58%). These folks are generous, to be sure, but have also reaped as no one else the benefits of a generous government and even more generous electorate. It is payback time, to the National Treasury, not only to the "charity of your choice," Mr. Allen. How about $5 billion for America? Why should he have to give it to the government. He has already paid his taxes. What makes you think that they will spend the money wisely. Additionally, he's dead when this money is dispersed. I don't think he will be to concerned with tax law. Someone does a good thing (which he is not obliged to do) and still the jealous must criticize. Look at the beam in your own eye before pointing out the speck in anothers. I'd love to meet him and pleed my case for financial help!!!!!!!!!!!!!!!!!!!!!!!!!!!!!!!!!!!!!!!!!!!!!!!!!!!!!!!!!!! You would have to be able to spell first, to get his attention. The word you seek is "plead" not pleed. is wondering why they don't give the money to the government. with all of the national debt I'm sure the billions would help fix and get jobs etc. if they're giving away billions and 100 of them gave the government a billion then perhaps we won't owe china or whereever they're saying we owe national debt–any national debt. Even if the top 100 billionaires gave 1/2 of there estates to the gorernment, we would still be in debt. Also, maybe you should look at the river baby comment left by TheRealityChecker. Einstein, the national debt is 13.2 trillion. If 100 of them gave a billion dollars, the national debt would be 13.1 trillion. Yes I'm Phil Anthropy. When Can i expect my check? I think that setting up a planned giving effort and legacy is commendable. That money can do a lot of good if things are planned well. However, such a rich person is still left with more than most of us will see in a lifetime, so although it can do a lot of good, it isn't a sacrifice. There are plenty of "regular" people who give to various charities and organizations who actually have to sacrifice to do so. Perhaps these are the people who should be newsworthy for their giving.....Oh yeah, they don't do it to get any publicity. I really wish the extremely wealthy would buy up land and not ever develop it. Want to help the planet? Buy rainforests, Im sure 7 billion could buy a lot of land. Once the forests are gone, they are gone forever! Humans dont need help, the defenseless planet needs help. Wasting money on humans to perpetuate their misery is such a waste. Help the planet and the byproduct will help humans. I tried buying land and recently gave away my fortune, too. I would be happy if they would just give me enough to keep me afloat until the job market improves. My car isn't so appealing as a place to live but will be my next home if I can't find something by the time the next rent is due. I managed to get a reprieve this month but I don't feel so lucky for the coming month. But, the upside is that it is nice to know that they will be supporting charities in these trying times for all of us. Charities really suffer when the economy is bad and they are so important to the underpriviledged...especially children. There is no excuse for civilized society having children going to bed homeless and/or hungry when there is enough to go around. While my own situation is dire at this point in my life, I would give my very last scrap of anything to keep a child from going to bed hungry or without a roof over their head. I have had tennents i have let go for months on their rent as they didnt have work at that point..although you cant do that indefinatly, as a landlord i have costs too..rent has to pay the mortgage, electric, propane/oil, taxes, water, maintainance..it would be nice if something was in place to stop the inevitable slide to homelessness. Mandella is a communist pig. He spat in the eyes of America, who helped him with his reprehensible views. The top 5% pay more than 50% of all income taxes... not sure what you mean that the wealthy "pay little." Btw, this is coming from a married, Independent, middle-class person in the military, with an BS in engineering & MBA–not a wealthy Republican. If America made you wealthy, the kind deed is paying back to America by giving to the American society's like for diabetes, and cancer, parkinson's disease, heart association, organ donations, and food banks. Further down the line you could save your own grandchild vs. NOT. Home should be where the heart is. Just because Buffet and Gates are giving to another country you do not have to follow their ways. Spread the wealth is my topic. Actually, halfwit, it seems as if NOT spreading the wealth is "your topic." There are people in the world vastly worse off than the poorest Americans. You are a real piece of garbage, frankly. "If America made you wealthy..." There's where you're wrong right there. If a poor person rots on a street corner, did America make him poor? If you earn $5 an hour at McDonald's, did America make you mediocre? If you earn $50,000 a year, did America make you middle class? America doesn't make rich people, productive individuals in America produce wealth. Money is MADE. To presume your brand of thinking implies that he stole the money from someone. He did not. He gave value for value, doing so on grander scales due to his ability. Uhh, where in the article does it say he's not giving on the homefront? I see nothing that says he's donating all his money overseas, nor do I see it on the Paul G. Allen Family Foundation website. It's CHARITY folks, he doesn't HAVE to do anything... let me get this straight, the guy who helped develop the OS that runs 95% of the world's PCs needs to also save the world from famine, cancer, poverty, and all of society's ills. I'm guessing that everyone here has done more good for the World than he has, is that what I'm hearing? If he stopped at $1B, he would have donated 1/13th of his net worth to charity. Assuming you all brought home $75k last year, did you donate anything close to $5700? Considering much of americas adult onset diabetes is caused by the constant and growing sugar intake that the corporations like kraft etc and using to entice ever more consumers, especially kids, the high fat goods, the high salted good that harm our blood, hearts and other internals the best thing anyone could do is force the companies to be more responsible..that doesnt take charity...dont alleviate a problem others are activly causing, force them to stop. As for finding cures for things, the medical research companies have long wasted money on this premise..every so many years when their donations are down they state they are close to breaking something or other then when their donations go back up again its back to the wasting cash again. I am quite poor and am struggling to support my family while at the same time serving our great nation. How can I get some of this? Work. And be persistent. Persistence is omnipotent. The harder you work, the luckier you get. Might as well give it away–the government's going to take the other half after the Bush tax cuts expire. But here is something to consider, after showing everyone what happens to producers (the moochers and looters take it all), who is going to risk becoming one? We're choking the Atlases of the world. They're going to expire before they even have the opportunity to shrug. Agreed! It is time they stopped - we all stopped - supporting our own destroyers.